Read Red Spike issue #1 for FREE! ADRENALIZE WITH RED SPIKE ON MARCH 7TH! Image Comics is proud to announce the March release of RED SPIKE VOL. 1 TP, written by Jeff Cahn, illustrated by Mark Texeira (Wolverine, Punisher) and Salvador Navarro, edited by Dave Elliott and produced by Benaroya Publishing. RED SPIKE VOL. 1 TP collects issues #1-5 of the sold out miniseries and will include extras such as a gallery page of covers by veteran artist Mark Texeira and the diaries of Doctor Fairfield, creator of the Red Spike program. 70 years ago, the world began its race to create the first Super Soldier. In 2011, the United States succeeded… twice. Project Red Spike discovered that through the manipulation and regulation of the adrenal glands the super soldier was no longer just a dream. 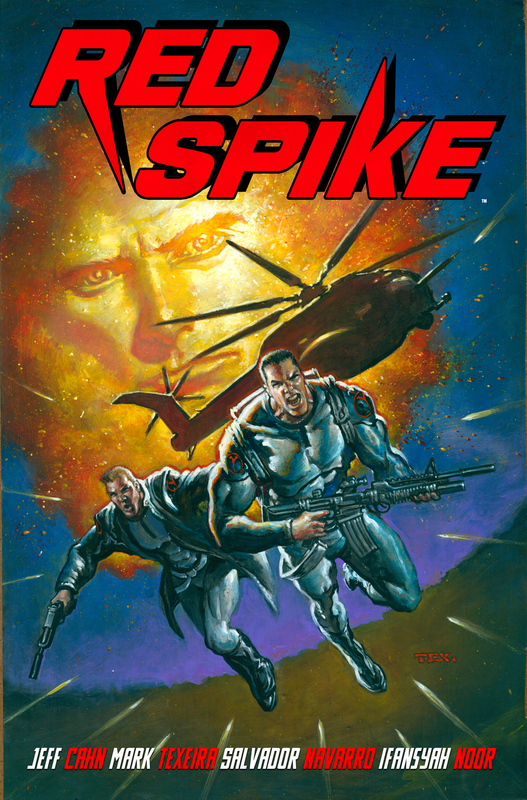 The world of RED SPIKE involves soldiers Matt Cutler and Greg Dane, the first to survive the Project Red Spike program. They have been proven on the field to be everything that was wanting in the program. Unfortunately, an upgrade to Greg’s implant goes array and now it’s up to Matt to chase down his friend before he hurts himself, the city and the tax payers who funded their creation. But as the friends begin their very public battle in heart of Washington, DC, twisted and sinister secrets begin to emerge from within the Red Spike program. Can both soldiers survive or are their deaths a necessary measure to secure the program’s secrecy? RED SPIKE VOL. 1 TP (NOV110411, ISBN: 978-1-60706-487-9), a 144-page full-color trade paperback, will be on sale in stores March 7th, 2012 for $12.99 and is available to order in the November 2011 edition of Previews. For more information, please visit www.benaroyapublishing.com. Mark Texeira is a born n’ raised New Yorker. Mark began honing his art from a young age, attending the Manhattan High School of Art and Design. After graduating, Mark was awarded a Presidential Scholarship at the School of Visual Arts, which he attended for two years before dropping out to pursue a professional freelance commercial art career. It was during this time that Mark attended classes at the Art Students League of New York, exploring new ways to create life in art. Winning mentions at the Salmagundi Club and The Society of Illustrators kicked off Mark’s work throughout the entertainment world. Mark is best known for his work on WOLVERINE, PUNISHER, VAMPIRELLA, and now, RED SPIKE. Salvador Navarro was born in Málaga, Spain in the summer of 1969. Being an artist was in the cards for Salvador . …but learning to pencil came later. In 2009, after several submissions, Salvador published his first book TALES OF WONDERLAND: TWEEDLE DEE AND TWEEDLE DUM with Zenescope Entertainment. Salvador went on to work WARD SIX with Kickstart, and is now the artist on RED SPIKE. Red Spike Trade Paperback available March 14th, 2012! Available for pre-order, Red Spike TP: Vol1 will be on sale March 14th, 2012. Make sure your local book store or comic store orders your copy. This paperback collects Red Spike #1-5 and includes special never-before-seen extras. 70 years ago, the world began its race to create the first Super Soldier. In 2011, the United States succeeded… twice. Project Red Spike discovered that through the manipulation and regulation of the adrenal glands the super soldier was no longer just a dream. Matt Cutler and Greg Dane, the first to survive the process, have been proven on the field to be everything that was wanting in the program. Unfortunately, an upgrade to Greg’s implant goes array and now it’s up to Matt to chase down his friend before he hurts himself, the city and the tax payers who funded their creation. But as the friends begin their very public battle in heart of Washington D.C., twisted and sinister secrets begin to emerge from within the Red Spike program. Can both soldiers survive or are their deaths a necessary measure to secure the program’s secrecy? For wallpaper images of Red Spike, Samurai’s Blood and Marksmen, simply go to www.facebook.com/benaroyapublishing and check out the photos section. At Benaroya Publishing on Facebook, you’ll also find the latest previews, reviews and interviews. Benaroya Publishing is now on Youtube! Want all the latest video reviews and interviews for titles such as Red Spike, Samurai’s Blood and Marksmen? Well, now you can go to www.youtube.com/benaroyapublishing and get it all as well as exclusive interviews with our writers, creators and artists. See part 1 of our exclusive interview with Red Spike writer, Jeff Cahn!